This is really gorgeous Sylvie. I love the way you have used that MB die to make the bauble and the colours are beautiful. I have missed some fantastic cards from you. Weather not too bad at the moment! Lovely Christmas card, Sylvie. I love your bauble, the colours and your design layout. Beautiful CAS card - you are so multi talented! Gorgeous Christmas card Sylvie. Love the CAS design. Yes, Bank Holiday here and the weather is set to be scorching tomorrow! Looks great...even with the wee "cheat' teehee! Such a fantastic use of that die...this is so sweet! 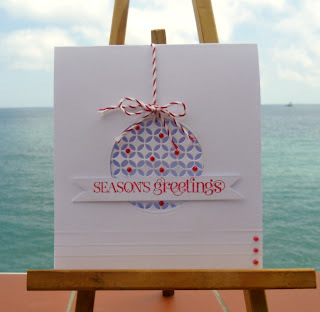 Another Christmas card for your box Sylvie .. . and a lovely one at that!! The weather was lovely for our bank holiday (for a change)! !